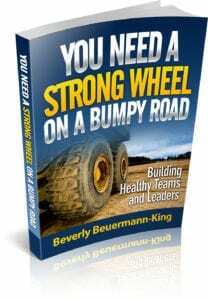 Bumpy Road: Building Healthy Teams eBook - Work Smart. Live Smart. "YOU NEED A STRONG WHEEL ON A BUMPY ROAD"
DISCOVER WHAT IT TAKES TO BUILD A HEALTHIER, HAPPIER, LESS-STRESSED TEAM. You Need A Strong Wheel On A Bumpy Road! will help you BUILD resiliency for your team and for yourself.